One major problem we have in Ghana is our tendency to blindly copy others without understanding the context or even making adjustments for our peculiar situation. As Chinua Achebe said of Obi Okonkwo in his novel “No Longer at Ease” when Obi was arrested for taking a bribe, Obi wanted to do what everyone was doing without finding out how it was done. What is this monster called the Independent Examinations Board (IEB) that has the effrontery to fail 81 percent of law students making only 19 percent eligible to be called to the bar? Why can’t the lecturers who taught these students set and conduct their own examinations as was done in my days in 1987 when I was called to the Ghana Bar? Who advocated for this change and for what purpose? I suspect that the IEB phenomenon is an attempt to parallel what happens in the United States in the conduct of bar examinations. If that is the case, that is a gross misunderstanding. Every State in the US is autonomous in deciding who practices in its courts. Thus the bar examination requirements are peculiar to each state. Each state determines who qualifies to sit for its bar examination, the passing grade and issues relating to character and fitness to practice law. New York, Washington DC and California for example, allow foreign-trained lawyers to take the bar examinations without first obtaining a Juris Doctor (JD) degree from a US Law School. Other States do not. The need for an independent board of law examiners to conduct the examinations is because, at any time, there could be students from hundreds of US and foreign law schools taking the same examination. When I wrote my New York bar examinations in 1994, there were students from India, the UK, Bangladesh, Pakistan, Nigeria etc., in addition to US law school graduates, all being tested on their knowledge of Federal and New York State Law by the New York State Board of Law Examiners. As stated earlier, the need for an independent board of law examiners in New York is because examinees come from hundreds of law schools and from many countries. As far as I know, Ghana, has only one professional law school which is the Ghana School of Law, from which students are admitted to the bar. What then is the need for the IEB? Who are they independent from? Why needlessly adopt the board of law examiners model used in the US? I would join others in recommending that the IEB be scrapped and the old system where law lecturers conduct their own examinations be reinstituted. Added to our blind copying is our lack of foresight and planning; and our stubborn refusal to consider or even tolerate change when adverse facts stare us in the face. During my professional law school days in the mid-80s, there was only one law faculty, the Faculty of Law at The University of Ghana, Legon. Once we passed our LL.B. or BA (Law) or Q.C.L. examinations, we were automatically admitted to the law school without having to sit for any entrance examination or an interview. The capacity of the law school was equal to that of the number of students graduating from the Faculty of Law. When Ghana decided to permit multiple schools to run LL.B. programs, some thought should have been given at that time to the fact that there would not be enough space at the law school for all those graduates. This lack of foresight and planning is what has created the current headache for the General Legal Council (GLC) which is responsible for legal education and admission to the bar in Ghana. We now have, I read, 3000 students intending to enroll in a school which can only accommodate 500. Instead of thinking much more broadly about a comprehensive solution, the GLC went for the facile one of an entrance examination and an interview without much thought or care about the future of those thousands of LL.B. graduates who are not able to make it to the law school and become lawyers. When this approach was declared unconstitutional, the GLC again, thinking narrowly, dug in its heels, refusing to look at the broader picture and rather introduced a Legislative Instrument (LI) in Parliament to give imprimatur to the previous illegality. Here again, I would join others to call for the withdrawal of the LI or its defeat by Parliament so that the GLC can now sit down with stakeholders and broadly consider and resolve the current issues dealing with legal education in Ghana. 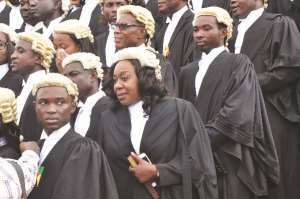 One solution to the current imbroglio, which has been suggested by others, including Professor Kwaku Asare is to have the schools running the LLB programs also run the professional law course with the curriculum determined by the GLC. The GLC will then have two options. If it is satisfied with the quality of the programs and the competency of the graduates, it can admit them to the bar based on passage of their individual law school examinations. The other option for the GLC is to conduct its own bar examination for all the LL.B. and Professional Law Course graduates in order to ensure competency. There are many issues raised by this proposal, the most serious being that of the institutional capacity of the law schools to add the professional law course to their curricula and the availability of competent lecturers to teach those additional courses. These are however, matters that call for a national discussion by all those interested in the future of legal education in Ghana. The current difficulties of the GLC is a result of resistance to change, inability to manage criticism and too much love for the status quo. When the issue of lawyer advertising came up, many voices were raised pointing to changes in many countries allowing lawyers to advertise, including the UK, from which we copied the prohibition on lawyer advertising. Many also pointed out the breach of this disciplinary rule by some of the very lawyers sitting on the disciplinary committee, who had websites. Instead of using this opportunity to listen broadly to those commenting on this issue, invite suggestions and take a new look at the concept of advertising (or “touting” as they call it), the GLC, in a rearguard action, merely amended the disciplinary rules to allow for attorney websites. This is incongruous, since having a website is the widest advertising an attorney can engage in. Some could interpret this as a thinly veiled attempt to shield certain individuals from criticism, and to retroactively legalize prior breaches by some, of the advertising rules. And talking of resistance to change, telling a Ghanaian lawyer to lose his wig, bib and gown is to invite a fight. The United States, as a sign of its independence from Britain decided to do away with these accoutrements for their lawyers. Even in the UK, as of July 13, 2017, lawyers and judges broke with centuries-old tradition and ceased wearing white horse-hair wigs in non-criminal cases. They also dispensed with wing collars and bands. These same suggestions have met with fierce resistance from the bench and bar in Ghana. My hero in this regard is the eminent lawyer Kobina Sekyi, who was called to the bar of the Inner Temple in 1918. He defiantly wore his kente cloth to court in the 1920s to make a statement. He had nothing but contempt for those of his compatriots who pathetically showed that they could not live without the dressing and habits they had picked up from the West. He was a true Africanist to the core. I hope for that day when we will take our independence seriously and stop being more British than the British themselves.